← What we did last night. White Night, Guillemots and more I *heart* Brighton joy. It’s time for another one of those I love Brighton posts. This time it’s because of the world of White Night. A festival of arts and craziness that marks the turning back of the clocks, a celebration at the start of the time of our year when the curtains are drawn at 5 and lights are needed on the cycle to and from work. As someone who is affected by lack of sunlight and who experiences a fair amount of darkness and despair in my soul at times I love the events in Brighton set out to mark the turn into winter, I love the effort to bring some light into these dark days. Saturday night in Brighton felt a lot like Brighton Festival should feel, lots of people wandering the streets from cafe to garden to iconic Brighton place experiencing installations, encountering people doing strange and unusual things, getting involved, talking and laughing, dancing and drinking. 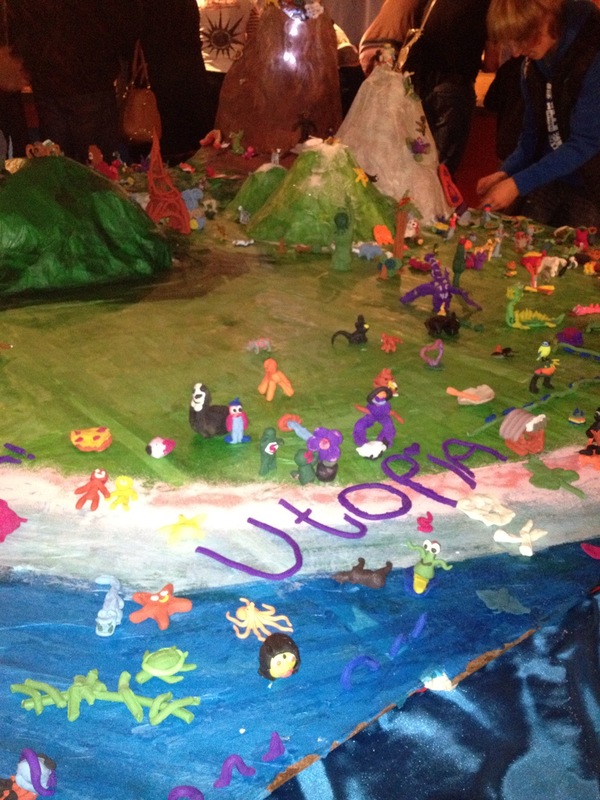 The theme this year was Utopia, again a stab at hope in the mess that makes up our world at the moment. We went to Moksha Caffe and listened to Gavin Ashenden (University Chaplain) ponder whether Utopia really existed, how we could love well in this world and what makes us really human. Awesome deep stuff. 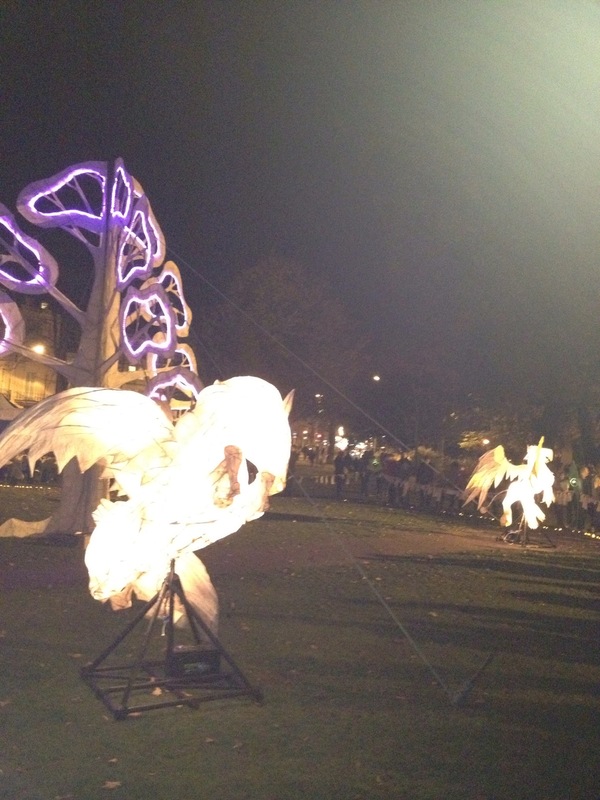 From there we wandered across the Steine gardens, to a tree of hope, surrounded by Pegasus horses made of paper maiche and encircled by rope with bits of cotton hanging off them. On closer inspection we discovered that these bits of cotton had wishes on for the past, present and future, wishes for what Utopia might mean in peoples lives. I found this achingly sad, especially after Gavin’s talk, is this all Utopia is? Wishing in the dark? Where is the One who helps us see us as we really are and offers real hope of love in the dark, life in the dark and one day a home away from the dark? Our path then led us to the Pavilion, a quick tour of the museum, making plasticine models in a Utopian world, reflections on the worship of technology and it’s role in providing us with Utopia and dancing to uber cool swing music at the hope cafe. We headed home through the North Lanes, encountering some Supermen engaged in a dance whilst on mobility scooters, entertained by the amount of dressing up going on, the diversity of the crowd, lairy teenagers, interesting arty types, boozed up guys, middle class posh families and more. The Open Market gave us a hive of fun and interesting films before we staggered up the hill to bed. Fascinating stuff and that was just the tip of the iceberg. Next year I think I want to run the crazy midnight Half Marathon, it’s got to be worth it for the time knocked off as the clocks go back. Last night we added to the Brighton joy by heading to the Old Market in Hove to see the Guillemots. They were supported by Tanya Auclair who was a modern pretty singing lady version of a one man band, looping rhythms on top of each other to create a full band effect and then topping it off with gorgeous vocals. The Guillemots provided their blend of interesting lyrics, thundering anthems interspersed with tender spaces and soaring light. Music that makes me want to dance and sing my head off. (Being all English and reserved I shuffled and mouthed along.) I realised once more that I really only care about looking at the drummer all the way through gigs. I loved the acoustic numbers and I loved beyond all the crazy drumming at the end of Sao Paulo to end the evening. And that’s my Brighton round up for this week. Your correspondent, hoping you aren’t bored of I *heart* Brighton ramblings and wondering if Utopia really needs a capital all the way through this post. 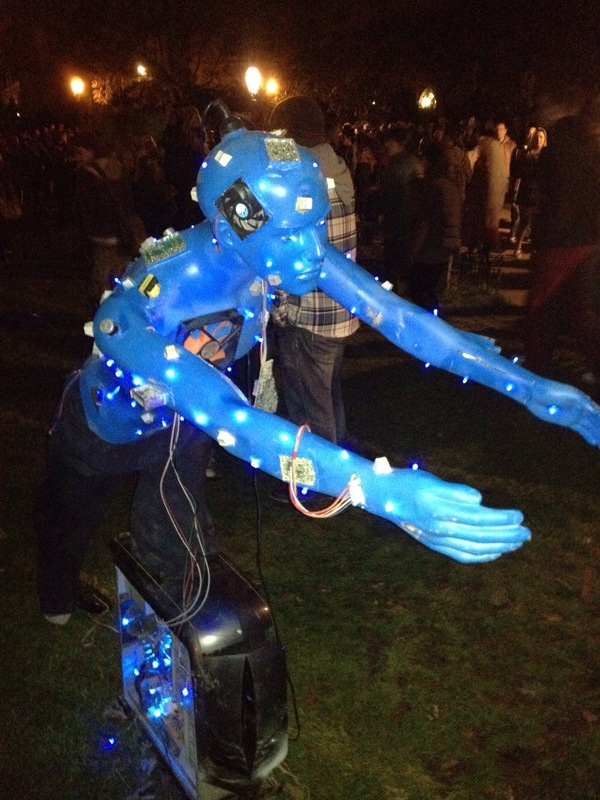 This entry was posted in Life on the journey and tagged brighton, hope, joy, Utopia, White Night. Bookmark the permalink.